Play the bonus game to learn about the Avenger's past! 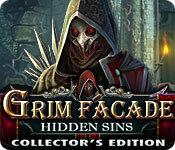 Grim Facade: Hidden Sins Collector's Edition is rated 4.2 out of 5 by 56. Rated 5 out of 5 by tutortime from Excellent Game ! This game played for hours. Interesting storyline, graphics were good ( colors a bit dark ), mini games were not the usual ones. No morphing objects, but you got to look for a collection of masks. The CC edition was worth the money as it was also surprisingly long and all new scenes and storyline. Rated 5 out of 5 by Torpedo1 from Deep in the Facade and saved from Grim by a Cat This could be a contender for game of the year. I have always found Grim a bit hard to play even on easy mode. This one was smooth sailing. Absolutely love the grim cat. Boy the critter action all the way down to movement of bugs was a real treat and back ground noise like you would really hear in the neighborhood from critters. Very excellent touches. I had so much fun that I could not tell you if it had a jump map but it switch around in different types of HO's and the work in those HO's were nice touches. Puzzles were great. Liked the crystal contraption I use to clear a room. Characters with their voice overs were very fitting. I just did not want the fun to end. Must buy for me and so far my favorite Grim Facade. Rated 5 out of 5 by mikesilverman from Get Ready To Die Graphic presentation / visuals are astounding, excellent, especially the animated sequences. 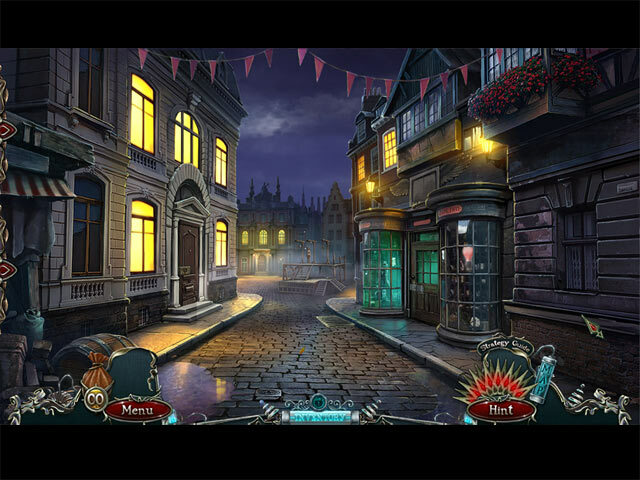 This game uses a variety of plot twists to move the story along, including that you must gather coins along the way in order to purchase items from the cart of a shady vendor in the village square. 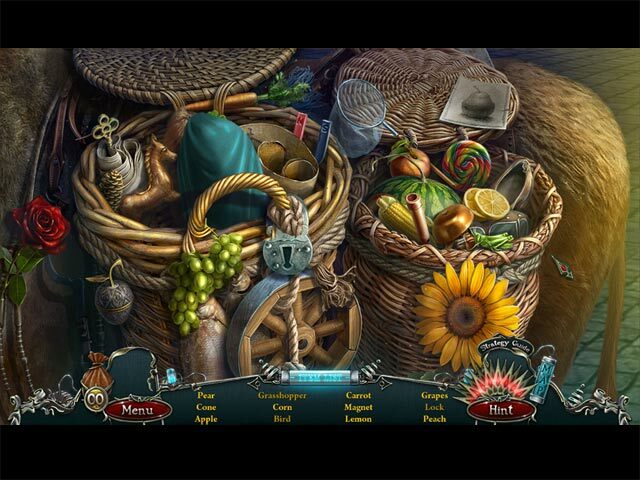 While the game has a lot of classic hidden object scenes based on finding items on a list, you will have to revisit some of them multiple times in order to obtain the items you need. Be very careful in searching each scene for items you can pick up and add to your inventory. Some items are not immediately noticeable and you might overlook them. There is a possibility of dying in the game, but don't worry, you have a way to return to life and pick up where you left off. Along with collecting coins there is also the opportunity to collect a variety of war helmets from different cultures and different time periods. These go into a trophy room that you can access and click on the helmets to learn the history behind them. There are also awards you can earn for completing various parts of the game. It is an exciting and compelling game that you want to keep playing as you search for a kidnapped woman , trying to save her life before the "avenger" kills her. Rated 5 out of 5 by onefeather from Great game ERS Love the game, ERS makes games fun and graphic's are good. Rated 5 out of 5 by karenmusik from Reminds me of why I loved this series. The last couple games in this series were so-so but this one goes back to it's roots. You are the detective called in to pursue a masked avenger. You even die a few times - I'll let you find out how you come back to life. Fun and suspenseful game. I did figure out the identity of the 'villain' early on, but that didn't take away from any of the entertainment value. Good HOPs and puzzles, good hint system and map, custom skill level, great bonus content, and even a twist at the end. Glad I bought it. Rated 5 out of 5 by kateblue222 from Another great game has kept me up way past my bedtime. A detective is tracking down a vigilante who is terrorizing a town for past injustices. People on a “blacklist” are dying. The detective must catch vigilante before the mayor of the town, who hired him and who is on the list, is killed. Others have described this game thoroughly, so I won’t list every feature. I will only discuss the things I noticed as I played through the first two chapters. There’s a really interesting cat. The art is beautiful and the colors are nice. Even the little tokens that you pick up are cute. The music fits the story well (I particularly like “Track 1,” which is the first one you hear when you start the game). The black and white movies disbursed throughout added to the ambience. In other words, five stars for sound and graphics. The HOS’s were good and the mini-games were very, very good. Play is seamless and natural. You can figure out what to do without having to hit the hint button all the time. SPOILER IN THIS PARAGRAPH, but it explains the way I figured out how to do something. The whole concept for collecting thoughts was unique and interesting, but the act of actually catching them was kind of boring because I did have a bit of trouble finding them (they are invisible and floating in the air). At first I kept sliding the thought catcher thingy up and down and back and forth, covering the whole screen in a methodical fashion. I caught a couple that way. But I don’t think that’s the best way. What I ended up doing for the rest was, I put the thought catcher thingy in the middle of the screen and slid the mouse straight up and down slowly. This caught the thoughts as they cruised through the middle of the screen. There were riddles. How fun! The achievements were “eh” and the masks which you collect were ok. At least the masks had some interesting facts accompanying them. But I don’t think either of these things helped the gaming experience, and I did not like the ends of the two banners for achievements and collectables that were always sticking out into the far left of the screen. They showed all the time. Unnecessary. The only jarring note in my whole playing experience so far was in the mayor’s introduction. OK, I can see why people on a vigilante's blacklist may be important people, a "who’s who" of the town. The people in charge are those in the position to perpetrate injustices that a vigilante would want to avenge. But to say that the mayor lives in “the nobility district?” Silly. Besides, since when is a mayor “nobility?” If this is the only thing I can find wrong with a game after playing it for two hours, I agree with other reviewers that it is one of the best games of the year. You gotta try it. Rated 5 out of 5 by Kirland from ER is BacK! Game of the Year Wow! I have to agree with all the great reviews on this game. I don't want to repeat again what has been already said in all the wonderful reviews. I agree. I am just so glad that ER is back. New storyline. Lots of mini-games with a choice of hard or casual. Some mini-games I excel at and others after I work them for a while then I realize I need casual. 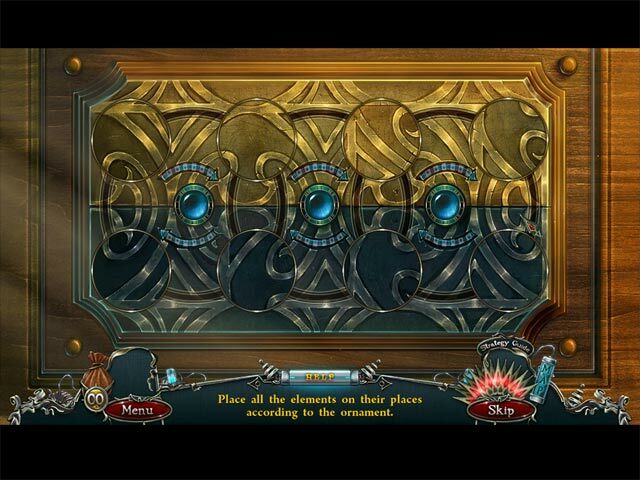 Hidden Objects are a variety so not to be boring. That has helped my boredom with Hidden Objects. I am not a Hidden Objects fan. Thanks ER and Big Fish. This is definitely the “Game of the Year”! Rated 5 out of 5 by Fuyu28 from Sounds The game was greath..but a very big flaw is the sound, all through the game, the sound didnt follow with the pictures/visual..